Award-winning gospel musician, Ohemaa Mercy, shocked fans and people of Bubuashie, when she verbally assaulted her lawfully wedded husband in public over a domestic issue. Ghanacelebrities.Com gathers Ohemaa Mercy was on set shooting a video for one of her new tracks in Bubuashie–a suburb in Accra. Whilst shooting arrangements were ongoing, the husband of the said musician stormed the set—very furious. What was his case – – he brought their breastfeeding male child to the gospel musician to breastfeed the hungry child who was crying loudly and looked pitiful. Ohemaa who did not take the issue lightly, verbally assaulted the husband. Her choice of words, were very chilly and whiffy. The shocking part was that, the more the crew around tried to stop her, the more she boiled up. The encounter created a scene- – with many inhabitants of Bubuashie staring at the gospel musician whom many see as very disciplined and cultured. 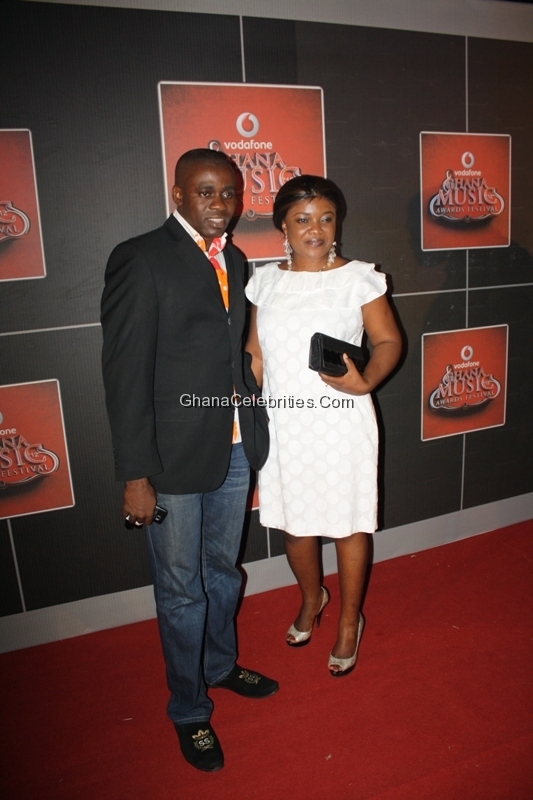 Ghanacelebrities.Com also gathered that there’s actually fire heating up in Ohemaa’s marriage. Apparently, this is not the first time the gospel musician has loudly disgraced and disrespected the husband. In similar scenarios at home, Ohemaa is alleged to have asked the husband to pack bag and baggage out of their matrimonial home. According to close sources to the couple, Ohemaa Mercy considers herself superior over her husband because of her status and fame in society. Due to her uncouth attitude towards the husband, Ghanacelebrities.Com has learnt the husband has enrolled in a University to upgrade himself – in order to fit into the status symbol race. We thought Gospel artistes were a little different—but it seems, the value is the same! TWEA KAI.. They are no exception. even from the way they dress, long eye lashes, concrete make up, long earrings and the most disgusting part is the BLEACHING. TYPICAL GHANAIAN OF SOME MEN, WHERE THEY THINK SOME TASKS ARE EXCLUSIVELY FOR ONLY WOMEN! FOR CHRISSAKE WE ARE IN THE 21ST CENTURY AND HE SHOULD HAVE KNOWN HIS WIFE WAS WORKING AND LEFT THE CHILD IN HIS CARE FOR NO REASON. I MEAN HE COULD HAVE BOTTLE FED THE BABY OR PROVIDED ANOTHER ALTERNATIVE TILL THE MOTHER COMES??? MOST OF THESE GOSPEL MUSICIANS HUSBANDS DEPEND ON THIER WIVES FOR FINANCIAL GAINS. THE WOMEN WORK HARD AND BRING THEM THE MONEY TO SPEND ON OTHER WOMEN. IS THIS NOT THIS SAME MAN ALLEGED TO BE. A FIRST CLASS WOMANISER??? OHEMAA SHOULD HAVE EVEN DONE WORSE THAN THAT TO HIM. CARRY PIKIN GO GIVE MAMA FOR BREASTFEEDING….. IN THIS MODERN AGE? COME TO ABROKYIRE AND SEE MEN BABYSITTING BABIES. ITS SAD TO KNOW THE NUMBER OF WOMAN SUFFERING EMOTIONALLY IN THIER MATRIMONIAL HOME AND YET STILL CONTINUE TO STAY BECAUSE OF FEAR OF DIVORCE. THE WORST PART OF COUPLES WHO FOUND THIERSELVES IN THE GOSPEL CIRCLE, LIKE GOSPEL MUSICIANS, PASTORS AND OTHER CLERGYMEN. THEY WILL TELL YOU GOD IS AGAINST DIVORCE. Me daase Kanewu!! Thank you for saying it all. Was surprised when I heard this new, didn’t even believe it but I think it isn’t a mere quarrel or dis or about breast-feeding…there really might be prolonged marriage problems; hopefully they settle their differences cs they ve bn each other’s backbone since IDEKW. Ka na wu,don’t insult innocent people because we read lies from pages such us this. Mr. Sefa thank you. This story was nothing to do with the husband and i was there. The husband was busily directing and managing the video shoot.He was not the one handling their baby. It was an issues between the artiste and the video director who had kept them waiting for hours eating into the midnight where a 3months baby was at stake.Ohemaa never insulted anyone ,she just drove away and her husband was no where close to the scene.